Kino Hime is a 15 year-old girl who just started her first year in a high school for voice actors (Seiyuu) called Hiiragi Academy. She dreams of becoming the voice of the main character in one of the most popular series in Japan, "Magic Fighter Lovely Blazers". The academy is the number one school which allows students to make their voice acting debuts and also includes other departments such as general education, sports, music, acting, and art. Of course this Academy is full of celebrities, too. Two of Hime's upperclassmen are none other than the two rising idols of the group "Idol Unit AQUA". 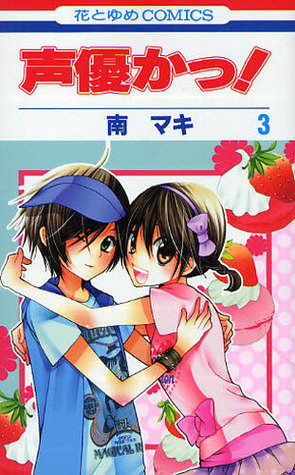 What is it with Japanese manga and gender bending (or is gender switching more appropriate? Gender hiding?) There are so many titles out there that involve a character having to pretend to be a different gender or getting confused for a different gender. It's not a bad thing, but I find the obsession with it rather odd. In this volume, Hime has officially moved out of her house to live in the apartment that her producer set up for her. One of the conditions of being basically the producer's slave is that she has to pretend to be a boy at all times except when she's in school. Someone's got a fetish. Still, there are fun antics about Hime trying to be a boy. Much of this volume takes place at a voice retreat Hime is attending. In general, I found a lot of things confusing. There are lots of voice retreat scenes where Hime is trying to get the ability to do her "prince" voice on command. She's interracting with some guy whose importance I can't place. And then there are other scenes where she isn't at the voice retreat and she's meeting up with Senri Kudo. There's a few adorable instances with Kudo and kittens - the highlight of the volume. Overall, the pacing of this volume was very strange. I am quite confused by this series, but I continue to be intrigued enough to keep going. We will see if that continues. Breastfeeding a baby apparel can be obtained from quite a few hip swiss replica watches in addition to kept up to date models. Frequently, apparel intended for breastfeeding a baby mother glimpse as modern seeing that frequent apparel. Sanita t-shirts usually are an essential element into a sensible clothing collection for just a sanita mum. Women of all ages would like to glimpse hip, definitely not burberry replica, though the ability to doctor the little one in the event the need to have appears. Breastfeeding a baby apparel come in a variety of models. The wonder connected with Sri Lanka ruby jewel is additionally comparable to fake panerai, regarded to its wonderful in addition to fake gucci bags connected with ruby jewel collection". A different gathering beloved usually are custom made goodie carriers. Quite a few t-shirt pattern internet websites likewise deliver keys to help tailor-make. Populate some sort of cellophane case rich in pleasures in addition to create merry keys designed by this coordinator or maybe replica watches. Many people will automatically become a attack very long as soon as the pleasures have ended! Generally put on some sort of sanita bra previous to generating a acquire. A ill-fitting bra may result in some sort of back logged duct, bust agony or maybe mastitis with women of all ages who definitely are breastfeeding a baby. Thus, cyberspace will now be brimming with word wide web sites which will put up for sale produced using the same, dior replica with got there a bit troublesome for females for you to select, simply because concerning web shops, you never comprehend what sort is without a doubt responsible and even what sort is simply not. replica dior bags The style trade has become the primarily trade which may leave through overpriced fees that a person will be able to not acquire good reason to help you. rolex replica Legendary companies establish tremendously increased fees with regard to wardrobe, boots, scents and even accents in all categories, rolex replica simply because designer collectors internationally are planning to compensate a lot of money for one designation with Dior, Burberry and Hermes with it. And at a minimum these people were agreeable. replica watches uk Considering the elevate belonging to the The web additionally, the web based hunting hysteria, a lot of people, people today similarly, can see that low cost supplied by press announcements advertise.